Background: Hospital-acquired infections (HAIs) are a threat to public health and addressing this issue will help to plan appropriate preventive strategies. Full-fledged active HAIs surveillance is the cornerstone in assessing the burden of HAIs. This study was planned to assess the burden of HAIs by implementing a hospital-wide active surveillance system in a large tertiary care teaching hospital in south India and compare findings with those of National Health Safety Network United States (NHSN US) and International Nosocomial Infection Control Consortium (INICC) India HAI rates. Materials and Methods: Active HAIs' surveillance was initiated in 18 Intensive Care Units (ICUs) from January 2015 to September 2016. All patients admitted in the ICUs were followed up by the infection control nurses, and surveillance was done for device-associated infections (DAIs). 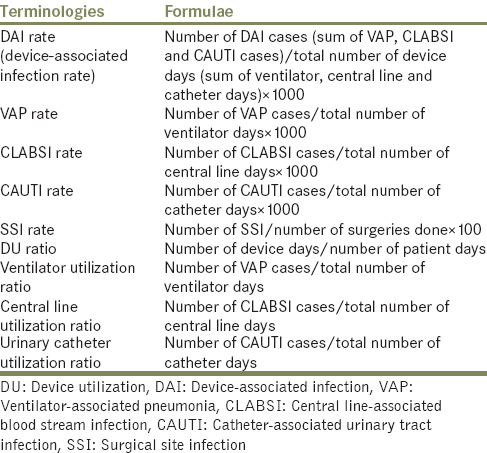 The cumulative rates of the DAIs and device utilization (DU) rates and surgical site infection (SSI) rates were determined for all the ICUs. These data were compared with corresponding NHSN and INICC India HAI rates. Results: Total number of patient days for the entire study period was 111294, pooled mean ventilator-associated pneumonia rate was 25.00/1000 ventilator days (NHSN US 2.0 and INICC India 9.4); Pooled mean central line-associated blood stream infection rate was 7.2/1000 central line days (NHSN US 1.1 and INICC India 5.1). The pooled mean ICU catheter-associated urinary tract infection rate was 6.1/1000 catheter days (2.1 NHSN US and 2.9 INICC India). The pooled mean SSI rate was found to be 3.5/100 surgeries. The DU rates had a significant positive agreement with the DAI rates. The DAI rates of most of the ICUs were found be to be higher than NHSN US and INICC India rates. Conclusion: There is an increasing need to implement an active surveillance system to detect and monitor the HAI rates which would be vital to implement infection control measures in a proactive manner rather than reactive. Hospital-acquired infections (HAIs) are a serious threat to global public health and one of the primary causes of patient morbidity and mortality. To address this issue of increasing burden of HAIs and to pave way for implementation of appropriate preventive strategies, the primary step is to assess the burden of HAIs. This needs a robust surveillance system. In a developing country like India, though the burden of HAI is higher, HAI surveillance continues to be neglected. This is mainly attributed to paucity of dedicated resources and lack of expertise in infection control. To the best of our knowledge, full-fledged active HAI surveillance is not being conducted in any of the large public sector hospital (>2000 bedded) of South India. Therefore, we planned this study to generate our institutional HAI data and compare it with that of benchmark figures. Primary objective: To assess the burden of HAIs by implementing a hospital-wide active surveillance system in a large tertiary care teaching hospital in south India and compare observations with those of National Health Safety Network United States (NHSN US) and International Nosocomial Infection Control Consortium (INICC) India HAI rates. Secondary objective: To assess the device-associated infections (DAI) in comparison to device utilization (DU). The study was done in a 2150 bedded tertiary care Government Teaching Hospital in Puducherry, South India. Our study was conducted in 18 Intensive Care Units (ICUs) catering to all surgical and medicine specialties with an overall 300-bed strength. All patients admitted to the 18 ICUs during the study were included in the study. Nine ICNs were appointed. In October 2014, our hospital decided to adopt an active surveillance program under the hospital infection control committee to track and monitor HAIs. The ICNs underwent a basic training on HAI surveillance according to CDC/NHSN surveillance protocol.,,, The infection control officer trained the ICNs by regular classes on HAIs and ICUs rounds. The surveillance data were collected by the ICNs using a standardized “HAI surveillance form” which was prepared in accordance to CDC and NHSN guidelines.,,, HAIs targeted for surveillance were surgical site infections (SSIs) and DAIs such as catheter-associated urinary tract infections (CAUTIs), central line-associated bloodstream infections (CLABSIs), and ventilator-associated pneumonias (VAPs). After the initial training period, each ICN was allotted specific ICUs for surveillance rounds which began in January 2015. The HAI surveillance form and the daily appraisal forms adopted from CDC were used to collect the data. Once an HAI is suspected by the ICN, it was reported and cross verified by the treating physician and the infection control officer. The data were entered into an Excel sheet on a daily basis and analyzed at the end of every month to generate the HAI rates and DU rates [Table 1]. Low-risk ICU (if the DAI rate is lower than NHSN and INICC DAI rate). Low-risk ICU (if the DAI rate is <75 percentile than NHSN US or INICC India). The total number of patient days for the entire study period was 111,294; maximum patient days were reported from neonatal ICU (37,201) followed by medicine ICU (8821) while surgical oncology ICU reported the lowest patient days (1147) [data as in [Table 2]. 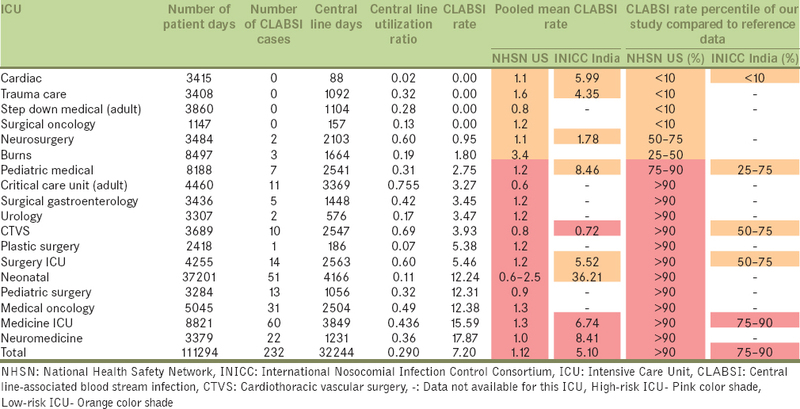 [Figure 1] shows the pooled mean DAI rates of all ICUs in our study as compared to that of NHSN US and INICC India. The pooled mean VAP of our study was 25, (P = 0.0001) CLABSI 7.2 (P = 0.0001) and CAUTI 6.1 (P = 0.0002) which were higher when compared to both NHSN and INICC pooled mean rate. [Table 2] represents the VAP surveillance report for the study period. Overall, the pooled mean VAP rate was found to be 25.00/1000 ventilator days, and the pooled mean ventilator utilization ratio was calculated to be 0.21. 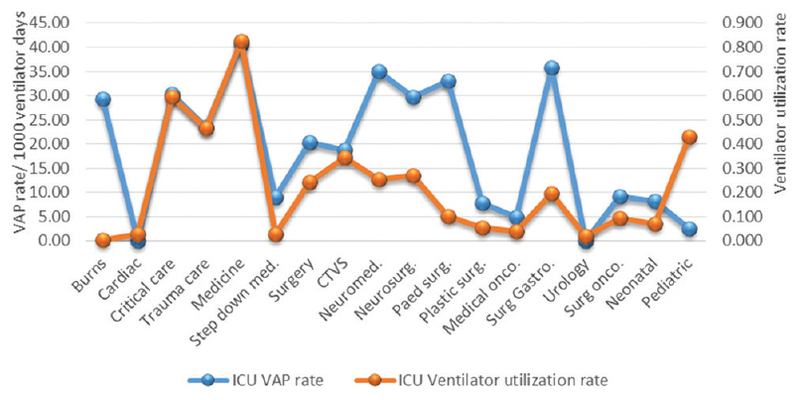 Medicine ICU reported the maximum VAP rate (40.61/1000 ventilator days). Cardiology and urology ICUs did not report any VAP case (zero VAP rate) during the study. As demonstrated in [Figure 2], the ventilator utilization ratio showed statistically significant positive agreement with VAP rate of the corresponding ICUs (P = 0.024) except in the burns and pediatric ICUs. When compared to the NHSN US VAP rates, except for the two ICUs that had zero VAP rate (cardiac and urology ICUs), the remaining 16 ICUs had a higher VAP rates and were categorized into high risk group. When compared with the INICC India VAP rates of the available ICUs, the VAP rates of our ICUs were found to be higher (high-risk group) except for cardiology. Compared to NHSN percentile, the VAP rate of all the ICUs (except for cardiac and urology ICUs) were found to be in the high-risk category. When compared to INICC India VAP rates percentile of the available ICUs, two ICUs (pediatric medical and cardiothoracic and vascular surgery [CTVS]) were found to be in the low-risk group. However, these ICUs were placed in high-risk group when compared with NHSN US. CLABSI surveillance report has been depicted in [Table 3]. The combined CLABSI rate for all the ICUs was found to be 7.20/1000 central line days, and the central line utilization ratio was estimated to be 0.29. Neuromedicine ICU (17.87) had the highest CLABSI rate. Several ICUs (cardiac, trauma care, step down medical ICU (adult), surgical oncology) did not report CLABSI during the study. The central line utilization ratio showed positive agreement (P = 0.704) with CLABSI rate except for CTVS, neuromedicine, neurosurgery, neonatal and pediatric ICUs [Figure 3]. Except for six ICUs (neurosurgery, burns and the four ICUs with zero CLABSI rate), the CLABSI rates of remaining 12 ICUs were found to be in the high-risk group as compared to NHSN US data. Three ICUs (pediatric medical, neonatal, and surgery ICU) had CLABSI rates higher than the NHSN US data, but the rates were lower when compared with INICC India data. The CLABSI percentile of three ICUs (pediatric medical, CTVS and surgery ICUs) was >75 percentile of the NHSN US data but was <75 percentile when compared to INICC India data. 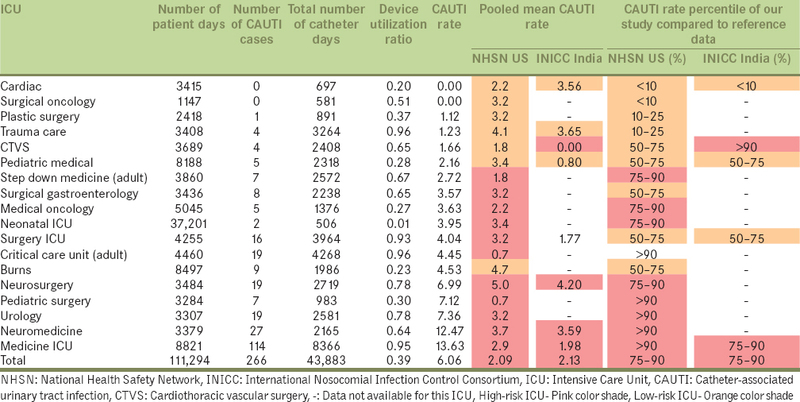 As per the CAUTI surveillance report depicted in [Table 4], pan ICU CAUTI rate was found to be 6.06/1000 catheter days, and the urinary catheter utilization ratio was estimated to be 0.39. The highest CAUTI rate was observed in medicine ICU (13.63) Cardiology and surgical oncology ICUs did not report any CAUTI during the study. The urinary catheter utilization ratio shows an overall positive agreement with the CAUTI rates of the corresponding ICUs (P = 0.190) [Figure 4]. Except for seven ICUs (cardiac, surgical oncology, plastic surgery, trauma care, CTVS, pediatric medical and burns), the CAUTI rate of the remaining 11 ICUs were found to be above the NHSN pooled mean CAUTI rate. Among these 11 ICUs, except for the surgery ICU, the remaining 10 ICUs were found to be categorized into high-risk group (>75 percentile) when compared with NHSN CAUTI rate percentile. The CAUTI rate of surgery ICU though was higher than the NHSN pooled mean CAUTI rate, but when compared with NHSN CAUTI rate percentile, it was found to be in the median range group (25–75 percentile). When the CAUTI rate of our ICUs were compared with both INICC India and NHSN US data, only one ICU showed discordant pattern in pooled mean CAUTI rate (CTVS ICU-had a lower CAUTI rate compared to NHSN US, but higher rate when compared with INICC India). The CTVS ICU showed discordant results based on CAUTI percentile (grouped in high-risk ICU [>75 percentile] according to INICC India but low risk [<75 percentile] according to NHSN US). The SSI surveillance report is depicted in [Table 5]. During the study, a total of 6746 surgeries were done, out of which 238 SSI were reported corresponding to an SSI rate of 3.3/100 surgeries. Maximum SSI rate was reported from the neonatal ICU followed by pediatric surgery ICU (13.95 and 11.11/100 surgeries done, respectively). 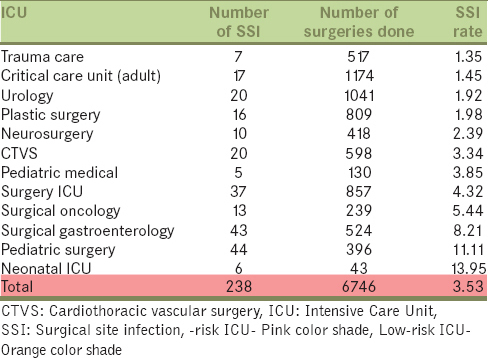 Trauma care ICU reported the lowest SSI rate (1.35/100 surgeries). In this paper, we report the establishment of a hospital-wide, unit-specific HAI surveillance system in a large tertiary care government hospital, which is the first of its kind reported from South India. The intention was to obtain a robust ICU-wise baseline data on cumulative HAI rate on an annual basis which can be used to do a root cause analysis on high-risk ICUs to plan control measures. The CDC's NHSN HAI rates  were used for comparison as they are globally considered the benchmark for HAI rates. Recently, INICC India data for HAI rates was published, which had taken 10 years (2004–2013) data pooled from 40 hospitals from 20 different cities of the country. Since this can be taken as Indian standard, we compared our study data with INICC India data, as well. As is evident from the study, the pooled mean DAI rate (VAP rate, CLABSI rate, and CAUTI rate) was found to be beyond 75 percentile of DAI rates of both the CDC/NHSN US and INICC India data. This is a matter of prime concern. However, there are several ICUs which were grouped into low risk when compared to INICC India but were classified under high risk when compared to NHSN US. Both the systems have their own pros and cons. NHSN has the advantage of being better representative of HAI rates as it collects data from nearly 4444 hospitals which include 259 large-scale hospitals. However, NHSN data represent the HAI rates of US and thus, cannot be extrapolated to developing nations like India as there are economic and ethnic dissimilarities and differences in health-care delivery system, infection control policies, and their implementation measures. Since for all the ICUs, INICC data were unavailable we compared it to NHSN US data. Therefore, it is recommended that developing countries should exercise caution while comparing their data with that of NHSN. Some studies have mentioned that in the absence of national data, NHSN US DAI rates of higher percentile threshold (75%–90%) can be used as a benchmark to compare HAI rates of developing countries. The INICC India DAI report 2016 was a commendable attempt to develop a DAI database which can be used to develop regional HAI standards. However, it had included data from only 40 hospitals (84 ICUs) out of which only six were large scale >1000 bedded hospitals. Hence, INICC 2016 report cannot be reliably used when comparing the DAI data of a large scale hospital in India such as ours. 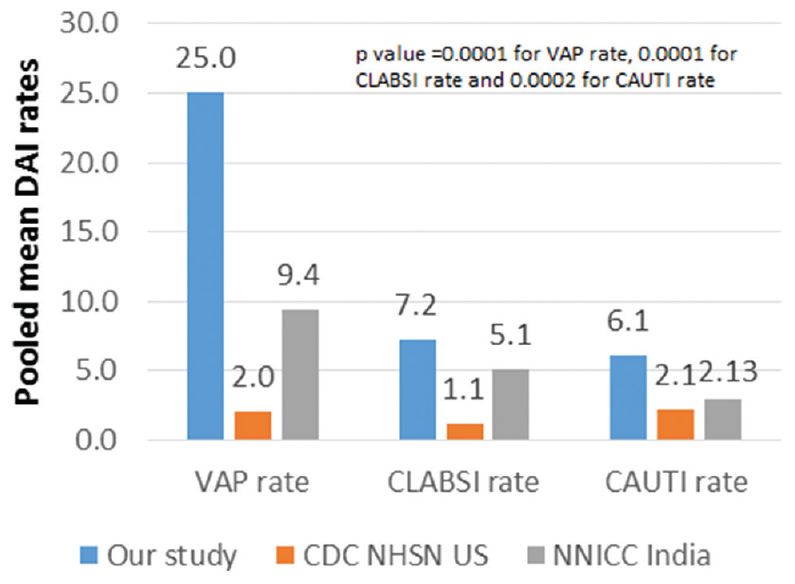 The pediatric, medical and CTVS ICUs were categorized into high-risk group for VAP and CLABSI when compared with NHSN 75 percentile but were classified under low risk for VAP and CLABSI when compared with INICC 75 percentile. 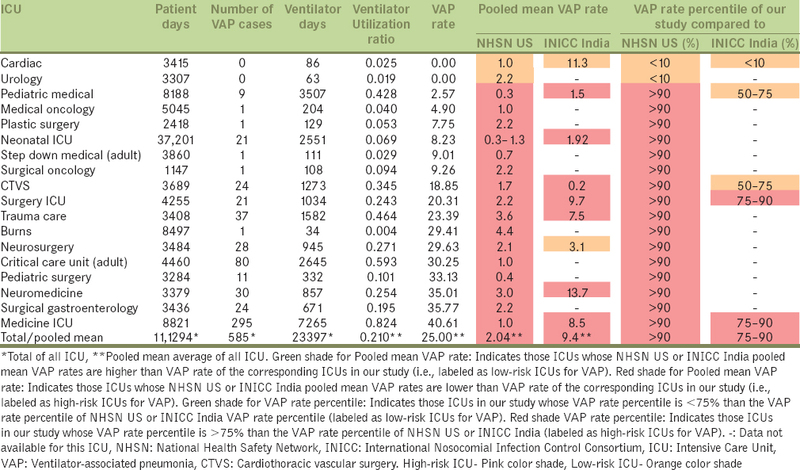 When the INICC India 50 percentile was used, both the ICUs were placed under high-risk group for VAP and CLABSI. INICC India report being a national pooled data, we strongly recommend that 50 percentile be used as cutoff rather than 75 percentile while comparing with other Indian HAI data. The discordance between NHSN 75 percentile and INICC India 50 percentile is very minimal. Our study documented an SSI rate of 3.53% (95% confidence interval 3.25–3.81). The SSI rates were found to be higher when compared with INICC and CDC-NHSN data., This signifies that there is a scope to introduce targeted interventions to reduce SSIs. The main limitation of our study is that it represents the HAI rates of only a single large government hospital which may not be truly representative of all the health-care settings in the Indian context, like private sector hospitals or smaller hospitals. Therefore, the pooled mean HAI rates of our study cannot be used for comparison of HAI rate in health-care settings that are of a different nature. Month wise trend of fall or rise of HAI rates was not analyzed. We could not classify SSIs based on the type of surgeries performed which could have provided for a better comparison with NHSN and INICC data. We have established a unit-wise active surveillance system to detect and monitor the HAI rates in our hospital. Such a system would be vital to identify areas with scope for improvement. Statistical analysis is often considered as a potential tool to understand the burden of HAIs and thus drives us to implement infection control measures in a proactive manner rather than reactive. Routine active surveillance of HAI identifies the problem areas at a much early stage before the problem escalates into a significant health hazard for the patient and hospital environment. Unfortunately, very few large teaching hospitals in India especially in the government sector have taken attempts to determine their HAI burden in detail. Our vision is to establish a central database for HAI for all hospitals in India. We believe that our study would serve as a step towards creating awareness about the implementation of routine HAI surveillance in all hospitals. Such an effort could pave the way for establishment of a nation-wide database for HAI in the near future. There is an increasing need to put in place unit-wise, active surveillance systems to detect and monitor the HAI rates which would be vital to implement infection control measures in a proactive manner rather than reactive. By this, we conclude that strict hand hygiene precautions and infection control practices have to be undertaken to reduce HAIs. Repeated education on hand hygiene to the health-care workers should be made to decrease the HAIs. Bundle care approach to be undertaken to prevent these DAI. We would like to acknowledge Dr. J. Balachander, Medical Superintendent of Jawaharlal Institute of Postgraduate Medical Education and Research (JIPMER), Dr. S. Sujatha, Head of Department of Microbiology and member secretary of HICC, JIPMER for their constant support. We also like to give our gratitude to all the residents of Department of Microbiology, JIPMER and the most important ICNs of JIPMER (Ms. Rani Thamizharasan, Ms. Ruth Lilly, Ms. Djiva Azhwar, Mr. Thirumavarasu G., Ms. Rajalakshmi Garnett, Ms. J Radjalatchoumy, Ms. Lathika Gladson, Ms. Vijitha V, Mr. Mohammad Aslam, Ms. Mehertaz Begum) for their immense help during data collection, and Ms. Ilaveni for her contribution during data entry and analysis. Lowman W. Active surveillance of hospital-acquired infections in South Africa: Implementation, impact and challenges. S Afr Med J 2016;106:59. Healthcare PS. National Healthcare Safety Network (NHSN) Overview. Mehta Y, Jaggi N, Rosenthal VD, Kavathekar M, Sakle A, Munshi N, et al. Device-associated infection rates in 20 cities of India, data summary for 2004-2013: Findings of the International Nosocomial Infection Control Consortium. Infect Control Hosp Epidemiol 2016;37:172-81. Allegranzi B, Bagheri Nejad S, Combescure C, Graafmans W, Attar H, Donaldson L, et al. Burden of endemic health-care-associated infection in developing countries: Systematic review and meta-analysis. Lancet Lond Engl 2011;377:228-41. Healthcare PS, Care BDL. National Healthcare Safety Network (NHSN) Overview. Available from: http://www.origin.glb.cdc.gov/nhsn/PDFs/pscManual/validation/pcsManual-2014-valid.pdf. [Last cited on 2016 Nov 09]. Centers for Disease Control and Prevention. “Surgical Site Infection (SSI) Event.” Procedure Associated Module (SSI). Atlanta, GA: Centers for Disease Control and Prevention (CDC); 2015. p. 1-26. Mu Y, Edwards JR, Horan TC, Berrios-Torres SI, Fridkin SK. Improving risk-adjusted measures of surgical site infection for the National Healthcare Safety Network. Infect Control Hosp Epidemiol 2011;32:970-86. Centers for Disease Control and Prevention. Identifying healthcare-associated infections (HAI) for NHSN surveillance. Atlanta: Centers for Disease Control and Prevention; 2017. Dudeck MA, Weiner LM, Allen-Bridson K, Malpiedi PJ, Peterson KD, Pollock DA, et al. National Healthcare Safety Network (NHSN) report, data summary for 2012, Device-associated module. Am J Infect Control 2013;41:1148-66. Singh S, Chakravarthy M, Chaya V, Jose T, Munshi N, Sengupta S. Analysis of a multi-centric pooled healthcare associated infection data from India: New insights. J Natl Accredit Board Hosp Healthc Provid 2014;1:39. Dudeck MA, Horan TC, Peterson KD, Allen-Bridson K, Morrell G, Anttila A, et al. National Healthcare Safety Network (NHSN) report, data summary for 2011, device-associated module. Am J Infect Control 2013;41:286. Cuellar LE, Fernandez-Maldonado E, Rosenthal VD, Castaneda-Sabogal A, Rosales R, Mayorga-Espichan MJ, et al. Device-associated infection rates and mortality in Intensive Care Units of Peruvian hospitals: Findings of the International Nosocomial Infection Control Consortium. Rev Panam Salud Publica 2008;24:16-24. Salomao R, Rosenthal VD, Grimberg G, Nouer S, Blecher S, Buchner-Ferreira S, et al. Device-associated infection rates in Intensive Care Units of Brazilian hospitals: Findings of the International Nosocomial Infection Control Consortium. Rev Panam Salud Publica 2008;24:195-202. Weinstein RA, Darouiche RO. Device-associated infections: A macroproblem that starts with microadherence. Clin Infect Dis 2001;33:1567-72. Available from: http://www.magonlinelibrary.com.sci-hub.cc/doi/abs/10.12968/jowc.2016.25.4.210?url_ver=Z39.88-2003&rfr_id=ori:rid:Crossref.org&rfr_dat=cr_pub%3dpubmed. [Last cited on 2016 Nov 15]. Singh S, Chakravarthy M, Rosenthal VD, Myatra SN, Dwivedy A, Bagasrawala I, et al. Surgical site infection rates in six cities of India: Findings of the International Nosocomial Infection Control Consortium (INICC). Int Health 2015;7:354-9. Akhter MS, Verma R, Madhukar KP, Vaishampayan AR, Unadkat PC. Incidence of surgical site infection in postoperative patients at a tertiary care centre in India. J Wound Care 2016;25:210-2, 214-7.